Over the last three weeks, I’ve been eating out at a lot of cheap Asian places, and while none of them have been so stellar that I felt like blogging about them, there have been a couple of stand-out dishes worth mentioning. So with the caveat that the following restaurants don’t constitute destinations on the basis of all their menu offerings, if you happen to be craving a good example of a particular dish, they are worth a visit. First up: Charuwan Thai in Tufnell Park/Archway, which benefits from a rave review in TimeOut. It’s hard to find good Thai food in London. I’m not sure why. Usually, I end up at Busaba Eathai or Rosa’s, which aren’t perfect, but are cheap, serve a spicy-sweet green curry and are conveniently located near my home and office. Charuwan Thai is a bit of a schlepp to reach, but it’s a nice-looking place with super friendly and attentive service. While the two curries we ordered (a green curry and chu chee pla — crispy fried fish topped with red curry in coconut milk) were overly-sweet and not very spicy, Jon and I really enjoyed Charuwan Thai’s pad thai. The rice sticks had great texture (not oily or clumpy the way it too often is served in restaurants), and the sweet, sour and salty flavors of the sauce were perfectly balanced. Prices were cheap with most mains costing less than £9. Assa is one of the several Korean restaurants lined up around Centre Point. The atmosphere is cheap and cheerful. Highlights were the starters (banchan), particularly the pickled radish and sesame spinach (skip the flavorless bean sprouts). Although Assa’s beef dolsot bibimbap was bland and the pajeon was greasy, limp and filled with flavorless seafood, the kimchi hotpot was excellent. Spicy, filling and warming the way great hot pots should be. (Koba, by the way, remains my fave place in London to eat crispy pajeon). Zen China, near the London Eye and Aquarium, is the last place I’d try out, except that once again blogger Mr. Noodles shared a valuable tip that the restaurant serves excellent Peking Duck. The restaurant is spacious and comfortable and has great views of Big Ben. Fellow diners were a mix of camera-toting tourists and groups of Chinese. And in case there was any doubt Mr. Noodles would lead you astray: the Peking Duck really is outstanding. Crispy skin, succulent meat, freshly-made pancakes and carefully-julienned cukes and scallions. Each element is excellent and together make a sum greater than the whole. The duck is served tableside, so when you order it, don’t let the waiter disappear with 1/3 of the duck left on the bone. Our waiter claimed he’d be using the rest of the duck to create another dish for us, but the additional dish was a meagre portion of diced duck meat in lettuce wraps. Bland and skimpy. 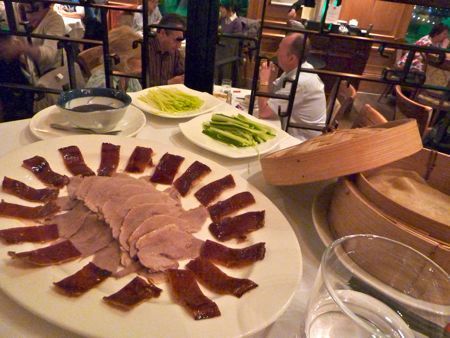 The Peking duck was the priciest item on the menu, but worth every penny. Last but not least, there’s Golden Day Hunan restaurant in Chinatown. Jay Rayner gave it a glowing review in this April 2010 review and in the same month, TimeOut’s Guy Dimond also had flattering things to say. Our group of four ordered several of the dishes highly recommend in both reviews, like the dry pot chicken, and we were underwhelmed by its lack of spice and flavor. 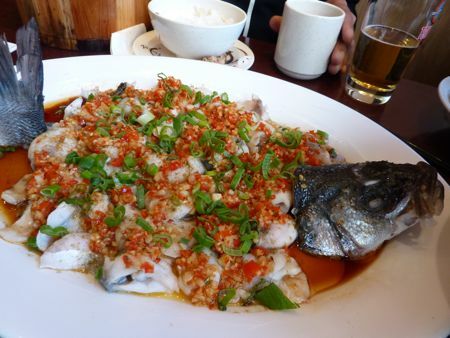 What was wonderful, though, was one of the chef’s specials, a garlic-and-chili fish. The fish’s flesh was tender and silken, and the garlic-and-chili topping was the sort of thing you’d gladly eat with plain white rice. For Thai food, Addie’s Thai in Earls Court is fantastic. We have started eating there 1-2 times a week. 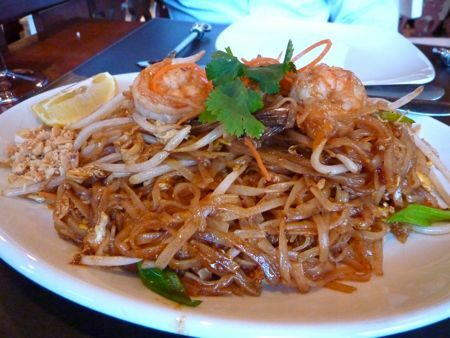 Tom yum and Pad Thai are both good as well as some of the more adventurous items they have. Worth it if you are in the area. As long as you’re making the trek to Tufnell Park, will you try Suchard Thai on Tooley Street? 7 minute walk from London Bridge Station. It was my old standby when I lived around there and even when I moved away, I would pop in every now and then and always thought it was affordably priced and quite decent. Don’t you just hate it when they take the duck away? Very little comes back out in the form of a stir-fry and they get to keep the carcass to make stock. No doubt the rest of the meat gets used in other dishes (for other people) too. This reminds me of a tip I got in China, just order the duck and don’t let it out of your sight! That said I like Zen China, and I’m glad you did too! Given its location, it could be a helluva lot worse. Thanks also for the mention. Great post! have you tried Young Chen on Shaftesbury Ave – just up the road from Golden Day? It’s super cheap and nothing flash, but a fun atmosphere and I love their prawn dumpling and noodle soups, and the roast pork on rice. Ooooh! Great tips – that fish at Golden Day looks stunning. I can imagine popping in for just that as a light dinner. OK. So Zen China. I must comment. Good food. But dishonesty gets annoying. When taking the duck away, they promise to bring back a stir fry. In our case, they brought back 4 1 inch squares of lettuce with about 3 tiny specks of duck on each. I’d say that they can get about 10 plates for each duck they take back into the kitchen. They do NOT bring back your duck in a stir fry. Just some extra random bits. Your duck ends up in another dish they charge someone else for. But then the bill presentation was the source of more dishonesty. The bill has a service charge. All fine and normal. Fair. But the waiter insisted on a tip on top. Only after confirming the the line marked “service charge” on the bill actually was the tip did he smile and admit the game. Good duck. But dishonesty left a bad flavour in the mouth. Great round up, have to add that Addie’s is one of the better Thai places in London. Haven’t been for a while, but I’ve heard it is still the same. A useful roundup, nice to see a list of asian restaurants that isn’t limited to Kingsland rd Vietnamese. I agree that Rosa’s is good for a cheap thai meal. The Thai Garden on Globe Road is also good – not for the carnivores as its only vege and seafood but not bad for a local Thai. I find Thai in London an eternal source of disappointment but good to hear there are a few you consider good enough for regular visits. @London Lady and @Mzungu – I have to tell you that I’ve been burned enough times on Thai restaurant recommendations that I’m reluctant to schlepp over to Earl’s Court, but hope springs eternal so I’ll check out Addie’s Thai the next time I have a Thai craving (which will be soon, I’m sure). @Krista – Fair enough. London Bridge is definitely a lot easier to reach than Tufnell Park. I’ll try out Suchard posthaste. @Greedy Diva – Quality prawn noodle soup, eh? Will definitely check it out. @Lizzie – Yes, the fish would make an excellent dinner, though it was a shame the other dishes we ordered there were so mediocre. @Jon – I guess that’s what we get for eating at such a tourist-friendly restaurant? @Louis – I actually think someone should do a roundup of Kingsland Road, though. I’m tired of reading about Mien Tay and Song Que. Most of the places on the Pho Mile have one or two strong dishes . . . you could make an excellent “progressive” meal if you knew what to order at each place. @SJ – Bethnal Green Road, eh? Not far from my office. I’ll try it out for lunch sometime, though I am a lover of pork. Dining in Florence - eh. An American in London travel and restaurant blog by An American in London is licensed under a Creative Commons Attribution-NonCommercial-ShareAlike 3.0 Unported License. Permissions beyond the scope of this license may be available at https://rwapplewannabe.wordpress.com/about/.